I woke up this morning later than I usually do — which is expected on days like this. Throughout the night, my bedside window screeched to accommodate the passing wind and the doors in my house shook on their hinges. Everything seemed to be rattling loudly, as if the typhoon were right above my roof — which technically it partly was. So with that in mind, I did what I usually do when typhoons pass by this part of town: I slid open my wood-frame windows, and stuck my head out like a bulldog out of a speeding car. The rain stung me slightly. It was actually only drizzle, made a tiny bit stronger by the (according to the CWB) 180km/h wind. Taipei was an air of calmness. No fallen trees, no overturned cars, no loose signboards or broken windows. It was as if the typhoon warning announced the night before was not for us at all. Turning on the news, however, it was a very different story. “Typhoon Morakot was the most devastating storm of the surprisingly deadly 2009 Pacific typhoon season, and was also the deadliest typhoon to impact Taiwan in recorded history. It formed early on August 2, 2009 as an unnamed tropical depression. During that day the depression gradually developed before being upgraded to a tropical storm and assigned the name Morakot, by the Japan Meteorological Agency late on August 3. The large system gradually intensified as it tracked westward towards Taiwan. By August 5, the JMA and JTWC upgraded Morakot to a typhoon. Due to the size of the typhoon, the barometric pressure steadily decreased; however, maximum winds only increased slightly. Early on August 7, the storm attained its peak intensity with winds of 140 km/h according to the JMA. The JTWC reported the storm to be slightly stronger, with winds peaking at 150 km/h , the equivalent of a Category 1 hurricane on the Saffir–Simpson Hurricane Scale. Morakot weakened slightly before making landfall in central Taiwan later that day. Typhoon Morakot wrought catastrophic damage in Taiwan, leaving hundreds dead and many more missing, most of whom are feared dead and roughly NT$110 billion ($3.3 billion USD) in damages. The storm produced copious amounts of rainfall, peaking at 2,777 mm, surpassing the previous record of 1,736 mm set by Typhoon Herb in 1996. 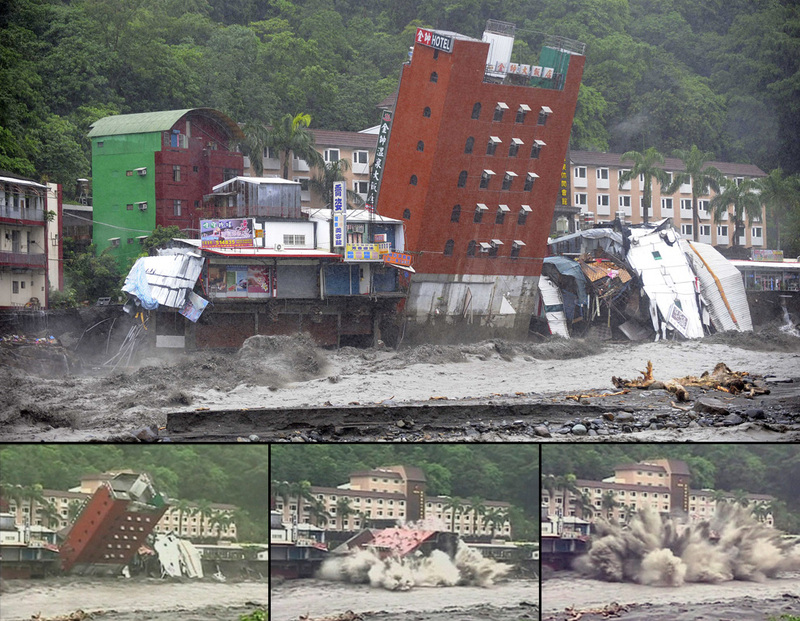 The extreme amount of rain triggered enormous mudslides and severe flooding throughout southern Taiwan. One mudslide buried the entire town of Xiaolin killing an estimated 500 people in the village alone. The slow moving storm also caused widespread damage in China, leaving eight people dead and causing $1.4 billion (USD) in damages. Nearly 2,000 homes were destroyed in the country and 136,000 more were reported to have sustained damage. In the wake of the storm, Taiwan’s government faced extreme criticism for the slow response to the disaster and having only initially deployed roughly 2,100 soldiers to the affected regions. Later the number of soldiers working to recover trapped residents increased to 46,000. Rescue crews were able to retrieve thousands of trapped residents from buried villages and isolated towns across the island. Days later, President Ma apologised for the government’s slow response publicly. On August 19, the Taiwan government announced that they would start a NT$100 billion ($3 billion USD) reconstruction plan that would take place over a three year span in the devastated regions of southern Taiwan. Days after the storm, international aid began to be sent to the island. I’ve always felt guilty and perplexed living in Taipei. The island of Taiwan is all in all around 500 km in length, which compared to some other countries is nothing. But why is it that when naturally disasters affect central and southern Taiwan the way they do, Taipei feels nothing? Of course I understand that nations generally choose safe regions as their capitals, places that are less susceptible to the unavoidably destruction of natural disasters, but I cannot get a proper night’s sleep knowing that just 150 km away, hundreds have lost their lives and even more have lost their homes. There must be something we can do here in Taipei. Start by donating money, old clothing, bags. Anything that can help the relief effort in the affected region. Taiwan, live strong, Taiwan unite. JSF.